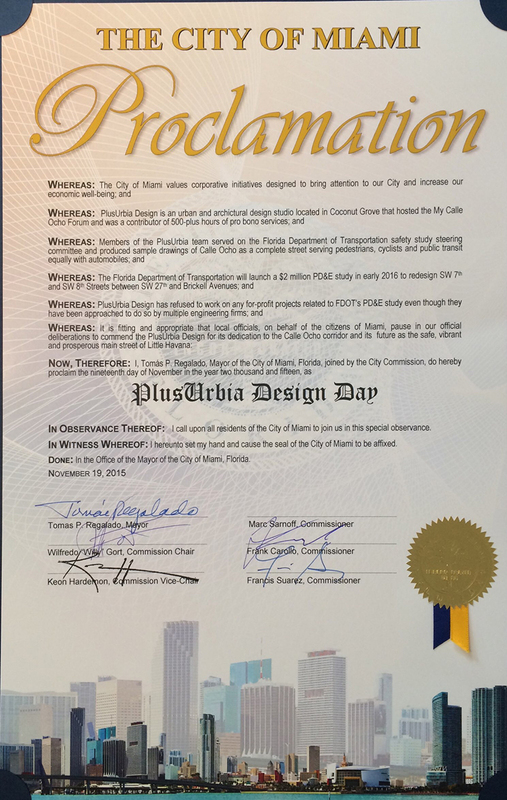 The City of Miami presented a proclamation on Thursday Nov. 19 honoring PlusUrbia Design for hosting the My Calle 8 Forum and contributing 500-plus hours of pro bono services. The Coconut Grove-based studio’s entire team produced sample drawings of Calle Ocho as a Complete Street that serves pedestrians, cyclists and public transit equally with automobiles. PlusUrbia’s vision of calmed, two-way traffic with wide sidewalks captured the imagination of the media, drawing coverage in print, on television, radio, web sites and social media.